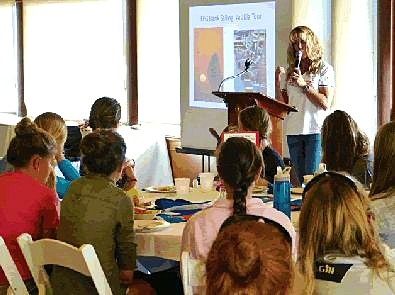 Rising Tide Leadership Institute Co-Founder/Ambassador Katie Pettibone was the keynote speaker at the 2013 US Junior Women’s Doublehanded Championship at the Bahia Corinthian Yacht Club, California in late June. 78 of the top junior women sailors competed for the US Junior Women’s Doublehanded Championship title. Katie shared adventures from her America’s Cups and Round-the-World Races and inspired the young elite competitors with the stories of Raya, Intisar and the Omani Women’s sailing team. Focusing on leadership, Katie introduced the competitors to the Rising Tide Leadership Institute, leaving them with a self-assessment performance tool and an invitation to fill out a more in-depth performance assessment survey on the RTLI website. Katie commented on the young women, “It’s energizing to be around a group of high performance oriented young women who want to constantly up their game. They motivate me even more as to the importance of our mission at the Rising Tide Leadership Institute – to help develop high capacity young women leaders.” Congratulations to 2013 US Junior Women’s Doublehanded Champions Carolyn Smith (Newport Beach, California) and Bayley Davidson (Costa Mesa, California)!